The Welly Awards will be presented May 18, 2016. We live in a special place. Our gorgeous weather, stunning landscapes, and world-renowned resort lifestyle lend themselves to beauty, good health, and tranquility. Many dream of living in this paradise. But we are just another American community with families, neighborhoods, businesses, and schools. We share many of the same stresses and are subject to the same health concerns as others throughout the country. We have to work at achieving and maintaining good health, and sometimes it is nice to have a helping hand. Fortunately, there are many within our community inspiring and helping us to learn–and to make–healthier choices. Desert Health® is proud to honor these unsung heroes through the second annual Desert Health® Wellness Awards presented by Desert Regional Medical Center and JFK Memorial Hospital. This year, thirty-three individuals and organizations were nominated in five categories: Individual, Business, Non-profit, Integrative Health Care Practitioner and Youth. Finalists have been selected and winners will be announced at the evening celebration on Wednesday, May 18. Nominees include entrepreneurs, doctors, educators, students and passionate individuals, all of whom are working to make a difference. Bringing all these community members together makes for a magical evening, and we invite you to join us. The festive celebration takes place at The Pavilion at Indian Wells Golf Resort and features dining stations for Mediterranean, vegetarian, and Paleo fans along with the “new” American Classics. We’ll have putting for prizes, a silent auction, and nationally acclaimed health crusader and Wheat Belly author William Davis, MD, as our guest speaker. Additional information can be found in the Official Program on page 15. 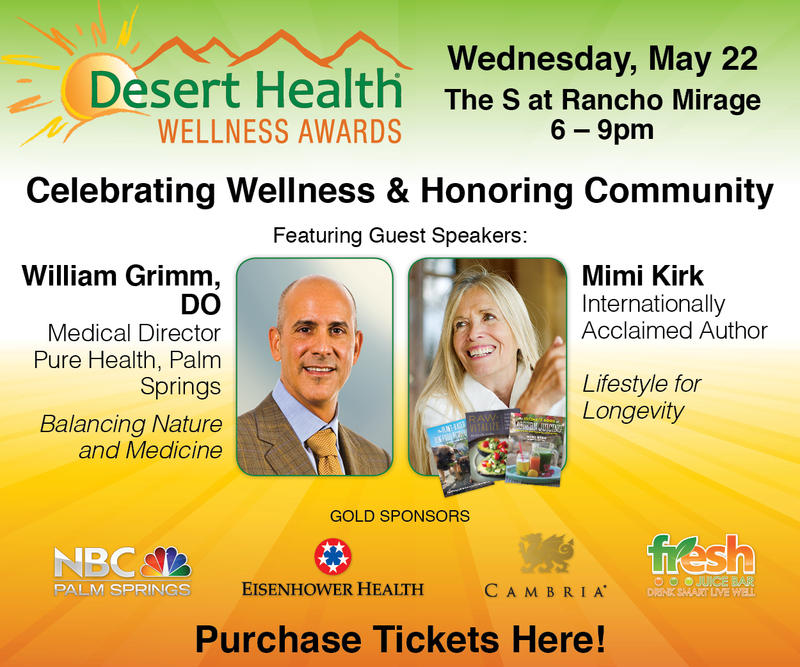 Come celebrate this special place we call home and those working to improve the health and wellness of our community at the second annual Desert Health® Wellness Awards.